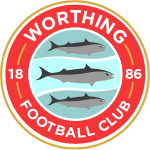 For the second time in four days, Worthing needed a stoppage time equaliser from Jalen Jones, to rescue a point from a game that, quite frankly, neither side deserved anything from. 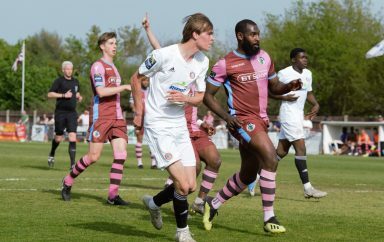 The only change to the team that snatched a draw from the jaws of defeat on Tuesday, saw new boy, Kwame Poku (yes, we’ve actually signed him this time) go straight into the starting line-up and, as a consequence, Darren Budd dislodged Hayden Skerry from the subs bench. In what was a great advert for insomniacs, the first chance of the contest fell to Ollie Pearce; who had been found by the aforementioned Poku, after he’d turned and played a perfectly weighted through ball for the striker to run on to, that lead to Pearce drifting across the front of Chris Doyle to create space for a shot, that AFC Wimbledon loanee, Nikola Tzanev palmed away. The same combination almost came to fruition again, moments later, as Pearce latched onto a ball over the top and made it to the byline but fired into the side netting, from an acute angle. Our number ten then scuffed his effort from Zack Newton’s pass before Potters Bar had their opening opportunity of the afternoon, when James Crane blocked Brad Sach’s effort. With the game only eleven minutes old, Josh Hutchinson sent Sean Bonnett-Johnson racing away from inside his own half and, despite being confronted by both Alex Parsons and Poku upon reaching the penalty area, still managed to shift the ball onto his favoured left foot and power home an unstoppable drive past Kleton Perntreou. Jones’ delicate header from Ricky Aguiar’s corner gave Tzanev an easy catch but a delightful piece of skill on the right-hand side of the box by Josh Gould, saw him nutmeg Andy Lomas, only to drill his attempt into the side netting. Midway through the first half, a long ball put Sach in the clear, though he was denied by the right boot of Perntreou; with James Budden heading well over the bar from the resulting corner. The Scholar’s next attempt was easily dealt with by KP, as he kept out a weak effort by Ben Ward-Cochrane, after he’d been discovered unmarked by Keegan Cole. 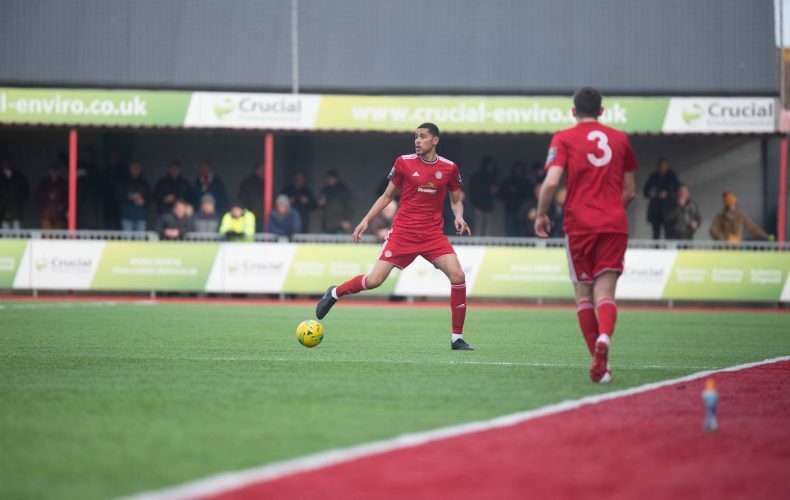 On the half-hour mark, Newton, hugging the left-hand touchline, played a pass inside to Jesse Starkey who, in turn, set Poku away inside the area, where he drove to the byline and whizzed a low cross in that evaded everyone and, the danger dissolved. Jones could only lift the ball over the goal, as Aguiar’s flag-kick was, pretty much, fired straight at him, as both teams continued to search for a breakthrough. One final chance of the period came when Aguiar was presented with a set-piece opportunity, that saw him drive his free-kick low into the area, which hit a sea of legs and promptly came back out for the midfielder to have a second go. Tzanev parrying and holding at the second attempt. Aguiar looked to catch Tzanev off his line, from kick-off but his ambitious punt ended up on the roof of the net. A corner failed to find an equaliser, when Crane headed back into the danger zone and Poku’s shot from the subsequent half-clearance hit a mass of legs before finally being cleared. Five minutes in, Poku’s pass to Gould on the right, appeared, at first glance, to have come to nothing, however, as Sean Grace tried to shepherd the ball back to his goalkeeper, Gould toe-poked it away for Pearce to almost capitalise on but, upon taking a touch to set himself, finished the wrong side of the upright, as Budden slid in. Goalscorer, Bonnett-Johnson released Cole through the middle, who checked back on to his right foot and played a short pass to his right, that was sent into the grateful arms of KP, from the edge of the box, by Sach. Then, at the other end, Newton sent Pearce scampering away down the right and he cut inside past Grace but substitute, Callum Kealy couldn’t apply a meaningful touch to his low delivery. 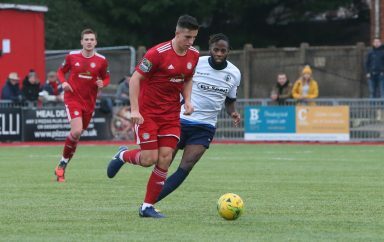 Reds tried their luck on the opposite flank, with Poku locating an unmarked Kealy in the area, only for Starkey to see his effort deflect wide off Captain, Chris Doyle. Visiting replacement, Dernell Winter was kept out by Kleton, at the base of his near post and a counter-attack let in Ward-Cochrane but, with limited options, he took the wrong one and fired wastefully over. Then, in added time, it happened again; Poku’s left wing cross was only palmed clear by Tzanev as far as Budd, whose low ball back in looped up into the air off the unfortunate Lomas, with the ’keeper repeating his trick, under pressure from Pearce and Jones smashed into the back of the net, from virtually on the goalline. Newton had an attempt deflected into the hands of Tzanev, after he’d seized on a loose ball and Aguiar’s recycled corner lead to Budd floating a delivery into the custodian’s grateful gloves. Cole had the final say when he pulled his shot wide, once he’d pounced on Starkey’s misdirected header and cut back across Aguiar.